We all know London has plenty of beautiful parks, but sometimes you need a secluded green space to take the weight off. An urban retreat you can duck into straight from the hustle and bustle. A place to sit and read, or eat an apple, and spend a little while. Read on for our favourite urban oases in London - where the city seems a million miles away. A few minutes from Dalston Kingsland station, the Dalston Eastern Curve Garden’s understated entrance belies the lovely long stretch of lawn, flowerbeds and benches that lie beyond. Situated on the old Eastern Curve Railway line that linked Kingsland station to a goods yard, the garden serves up coffee, cakes and alcohol and is a popular place for a midweek meet-up. It’s currently under threat of closure, as Hackney Council weigh up possible re-development of the area, so now is the perfect time to head down and show your support. Dalston Eastern Curve Garden can be found at 13 Dalston Lane, E8 3DF. It’s free to enter, and open every day. One of the most beautiful cemeteries in London, Brompton Cemetery hosts over 35,000 gravestones, several spectacular catacombs, a chapel, gorgeous tree-lined boulevards and a quiet atmosphere that inspires reflection. 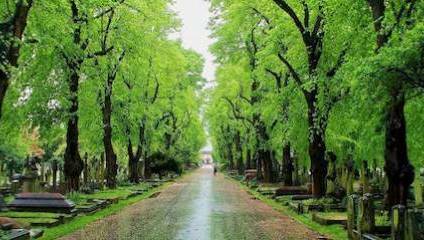 Some cemeteries can feel a little unsettling, but the Grade I listed Brompton is a celebration of lives lived, as well as a conservation area that houses over 60 types of tree and numerous bats, frogs, birds and insects. Emmeline Pankhurst is buried here, so you can pay your respects to one of Britain’s greatest social activists. Brompton Cemetery can be found on Fulham Road, SW10 9UG. It’s free to enter, and open every day from 7am - 8pm. The Barbican Conservatory only opens on Sundays, from midday till 5pm, so you’ve got to time it right to visit. It’s well worth taking a look around - the glass-ceilinged space is home to tropical fish and over 2,000 species of unusual trees and foliage. To find out more about the garden book a 60-minute guided tour - there’s one every Sunday for just £12.50 - or simply sit back and marvel at the abundant greenery, tucked away in the heart of one of the most stunning buildings in London. Barbican Conservatory can be found inside the Barbican Centre, EC2Y 8DS. It’s free to enter, and open every Sunday from 12-5pm. One of the most under-appreciated areas of the spectacular Natural History Museum, the Wildlife Garden, located just off the west courtyard, is a little miracle. It’s the only completely self-sufficient ‘wild’ garden in London, and it’s biodiverse mix of plants, insects and wildlife have thrived thanks to the help of the team of volunteers who help care for it. Home to over 3,000 different species - including nesting moorhens, rare moths, several species of bird and even sheep (for two months of the year) - the garden is a living ecosystem all of it’s own. The Natural History Museum’s Wildlife Garden can be found in the grounds of the Museum, SW7 5BD. It’s free to enter, and open every day. Natural History Museum Wildlife Garden courtesy of Now. Here. This. Like stepping into a scene from an end-of-the-world movie, St. Dunstan in the East is a remarkable garden in the grounds of a disused church. Built c. 1100, the church was badly damaged in the Great Fire of London and later the Blitz. The City of London decided against repairing it, electing instead to plant flowers and climbers in the grounds. The result is a wonderfully secluded, totally unique space that will soon have you under its spell. St. Dunstan in the East can be found on St. Dunstan’s Hill, EC3R 5DD. It’s free to enter, and open every day.